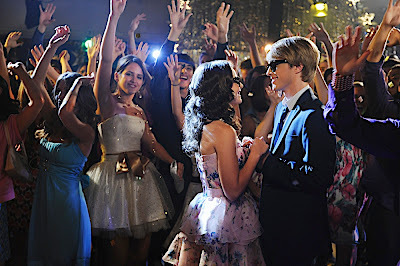 After accidentally whacking Jessica Olson (Danielle Campbell) in the head with a door, chart topping teen heartthrob Christopher Wilde (Sterling Knight) tries to ensure she hasn't lost all sense by asking her a question. But when the strong-willed, independent minded Michigan teen declines his offer for concert tickets to his next performance, Wilde fears for the worst, slipping past the paparazzi to take her to see his brother-in-law at the emergency room. Luckily it isn't serious but for Wilde, it's brand new territory to meet a gorgeous girl in his age bracket who doesn't use phrases like “chat about a text quoting a blog” and soon the musician realizes he's started to fall for Jessica who candidly admits to liking his music but not all of the screaming craziness that goes with it. In this entertaining Disney Channel Original Movie, Cinderella meets Notting Hill. 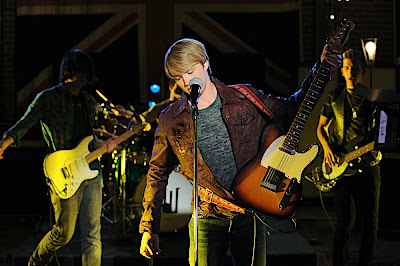 Jessica tags along with her Christopher Wilde obsessed sister when the girls journey to Los Angeles for a family vacation only to find herself having all of the up close and personal encounters with the megastar that her sister (Maggie Castle) has been dreaming of since Kalamazoo, memorizing his favorite haunts to try and create the type of casual meetings that Jessica keeps stumbling into in secret. With the paparazzi and Christopher Wilde's own insecurity about the real world verses his world threatening their burgeoning relationship, the two teens must face whether or not to be true to themselves or our “starstruck” society of class differences as the movie careens into a predictable but pleasant conclusion. While the Murphy's law accident prone craziness that encounters the kids after spending a postcard perfect day sightseeing Tinsletown feels like an inspired throwback to screwball romantic comedy as cars get stuck in the mud and they must fight and flirt their way back to town, unfortunately once they hit the beach, the movie goes right into autopilot mode, losing some of the genuinely comedic and unexpected charm it'd had been building as a cross between It Happened One Night and Romancing the Stone. Admittedly the rest of the movie is pretty forgettable and desperately needed more disastrous wrenches to be thrown in their path as the whole storyline could've centered on the two getting stuck and wandering back to town if they'd played their cards right from a screenwriting standpoint. However, tweens are sure not to mind when they get a chance to sing along to the over-produced studio tracks that fill StarStruck and its companion soundtrack CD from start to finish. Yet despite the fact that the uneven nature of this made-for-cable work fails to delight as much as other recent Disney Channel Original Movies, it still boasts enough positive messages about being true to yourself to make it recommendable for its target demographic who no doubt will be eager to track down this extended version of the March TV premiere that stars popular Disney actors from series like Sonny With a Chance and JONAS.